MEDIA RELEASE: The United Kingdom has produced a spectacular day two to retain the Mitchelton Wines International Challenge at the 2016 Australian Motorcycle News International Island Classic at Phillip Island. With the UK’s tireless campaigner Jeremy McWilliams again leading the way, the UK turned around a 12-point deficit to Australia after day one to run out an easy 99pt (693 to 594) winner, followed by impressive newcomer Ireland (421). America (355) and New Zealand (289) were fourth and fifth. 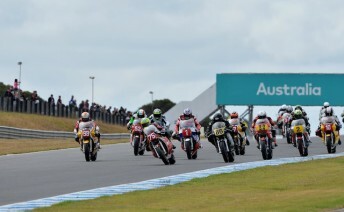 The balance of power emphatically shifted in this morning’s race three, as seven of the UK riders finished inside the top 10, while it was a disaster for Australia with only two of its team — Jed Metcher (Honda Harris) and Steve Martin (Suzuki Katana) — able to put together some really solid points. After a tough campaign, McWilliams was delighted with the UK victory. “The team was pretty nervous across the board this weekend after a lack of track time on Friday,” said the 51-year-old former grand prix rider. “In the first race on Saturday we simply weren’t up to speed, but race three was where we really turned it on. Roger Winfield, the man who supplies machinery for the top UK riders, was full of admiration for the effort. “There’s just a really strong rapport between the riders and mechanics in this team,” Winfield said. “Everyone lends a hand, and on the track we had quite a few riders with similar speeds which allowed us to keep on accumulating the points. Metcher was brilliant in winning race three — his first in the International Challenge — and he then continued his dominant form in the final six-lap race to finish equal on points (156) with McWilliams (Yamaha Harris) in the individual standings — the second tie in the past five years for the prestigious Ken Wootton Perpetual Trophy. Metcher’s two thirds and two wins produced the same number of points as McWilliams’ brace of second places, with the duo finishing well clear of third-placed Steve Martin (148). 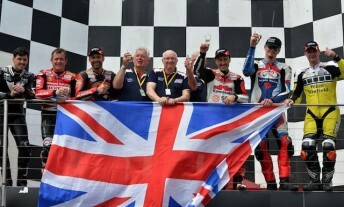 UK riders then filled the remaining positions in the top eight, with Conor Cummins (Honda Harris, 140) in fourth from John McGuinness (Honda Harris, 133), last year’s winner Ryan Farquhar (Yamaha Harris, 132), Glen Richards (Suzuki Harris, 132) and James Hillier (Yamaha Harris, 119). Australia’s Beau Beaton (Irving Vincent Black Lightning) was ninth overall on 118pts, winning the opening two races on Saturday before retiring with a mechanical gremlin in race three while in third position. 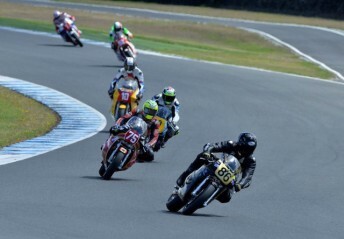 Meanwhile, it was a dirty weekend for three-time Aussie superbike champion Shawn Giles (Katana) who failed to finish two races after a slew of engine problems, while compatriot Cameron Donald (Suzuki McIntosh) only made it through 50 percent of the program as well. Former Aussie road racing champion Marty Craggill, making his International Challenge debut on the Yamaha TZ750, only finished one of the four races, adding another nail in the coffin for Australia’s attempt to win back a trophy it had previously dominated from 2005-2014. The highest point-scorer for Ireland was expatriate Paul Byrne (Suzuki McIntosh) in 11th overall, but it certainly would have been a top 10 finish if his Suzuki McIntosh hadn’t stalled on the grid in race four. Byrne’s teammate Ben Rea (Suzuki XR69) finished in 12th, while the highest point-scorers for America and New Zealand were Pat Mooney (Harris Yamaha) and Pete Byers (Honda CB1100) in 16th and 20th respectively. Beaton switched from his four to two-valve Black Lightning for the final International Challenge race and edged in front of McWilliams during the middle stages, which would have been enough for Metcher to claim the Ken Wootton Perpetual Trophy by 1pt. But the wily McWilliams was fully aware of the machinations and he wouldn’t have any of it — despite dealing with a broken steering damper. “When Beau went past me it was a kind of wake-up call,” said McWilliams. “I knew I had to pull my finger out, and I managed to get back past and after that I reckon it’s the hardest I have ever ridden around here — even when I was battling tooth and nail with Shawn Giles in 2014. I was leaving black lines everywhere and did everything I could to keep Beau behind me. There was another layer of intrigue to the McWilliams and Metcher battle: the former was the crew chief for Metcher during the 2012 world supersport season. But in the end nothing could separate the pair. “I couldn’t be happier with how it’s all turned out,” said Metcher, who set the fastest lap of the weekend in race three (1min37.287secs). “I managed the gap in that last race hoping that Beau would finish in second to allow me to take the individual honours outright, but it wasn’t to be. Still, I’m ecstatic. Metcher now plans to be back at Phillip Island next month to race as a wildcard in the opening round of the 2016 Superbike World Championship from February 26-28.